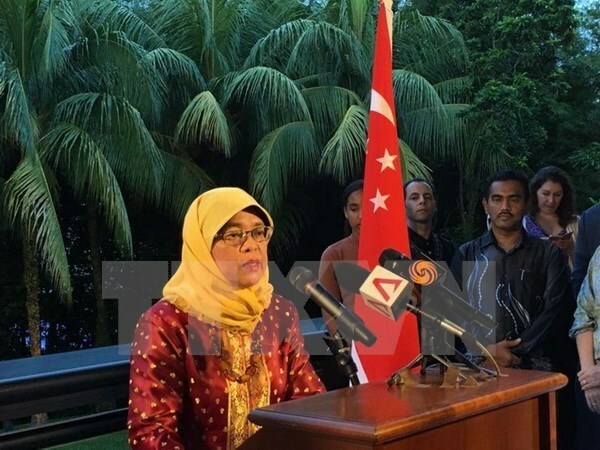 Singapore (VNA) – Halimah Yacob has stepped down as Speaker and member of the Singaporean Parliament on August 7 to run for the presidential election in September. She submitted her letter of resignation to Prime Minister Lee Hsien Loong. Prime Minister Lee said Yacob also leaves the ruling People’s Action Party (PAP), in which she was a member of the central executive committee. Yacob also sent a letter to Deputy Speaker Charles Chong, asking him to lead the Parliament until a new Speaker is elected. Yacob, 62, is the first woman in Singapore to run for presidency. Under the new Constitution of Singapore, the election will be reserved for a particular racial group if no one from that group has been president for five consecutive terms. This means the 2017 Presidential Election of Singapore will be reserved for candidates from the Malay community. The mechanism was initiated by Singaporean Prime Minister Lee Hsien Loong to ensure the multiracial representation of the country.